In this day of age, with all the technology and amazing inventions and services available, you'd think nothing would be impossible, let alone hard wouldn't you? However, we couldn't be more wrong, you may of heard about the latest Christmas crave which is The Elf on the Shelf. The tradition is becoming a quick world wide must, with elves visiting your homes for the festive season to monitor your childs behaviour, reporting back to santa on a daily basis, or so your child believes. I will admit, it has become a tradition for us, and Spud is not only excited for santa to arrive, but also for his elf's annual visit! We've done things that we never would of thought of without having our elf, things like a North Pole Buffet, a North Pole Breakfast and even a Elf on the Shelf themed Christmas party/gathering. However, we can't do it as big as our friends over in America because the lack of items available here on British soil. Luckily we have websites available that ship to the UK, but posting cost and customs charges soon add up, making the cost more expensive than a flight to America! Okay maybe that's a bit of an exaggeration, but still, you get my drift! One website that does seem to ship to the UK more than others is eBay, and with one search of the best eBay redemption codes bringing up many, it's easy to get a good a bargain including the postage cost! I'm helping host a competition for one lucky winner to win a $100 eBay gift card, and I'd love to know what you'd spend it on if you won? Would you buy a hamper full of American treats including fizzy drinks, candy and cereal? Or maybe you'd buy a pair of shoes that you can only get over in the states! What you spend the money on is completely up to you! I know exactly what I would buy if I was to win, it would all be spent on Disney items and Elf on the Shelf products! 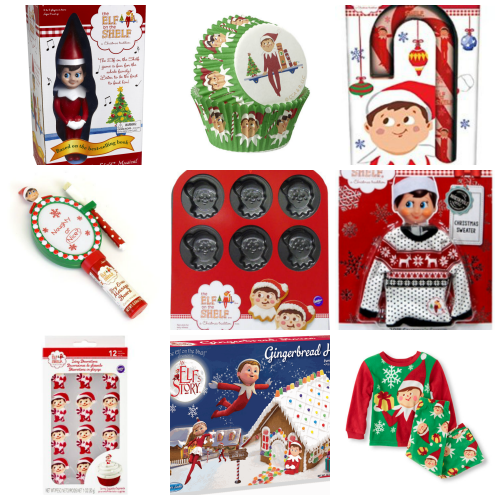 I've not got a clue where to start with the Disney items, as America is the home of Disney, and have so much more than us here in the UK, but I do know where to start with The Elf on the Shelf items, and instead of just writing the products down, I thought I'd show off pictures of the products as well! From cupcake cases and cake decorations to cookie/cake tins, from games to pyjamas, candy canes and gingerbread houses, the states really do have it all! If I could afford to fly over there, it wouldn't be for a holiday, it would literally be to buy lots and lots of Elf on the Shelf items! So here's your chance to spend $100 on whatever you please, the choice is absolutely yours!